Available in sizes 18" to 118"
We have over 100 years of experience in one award winning team. 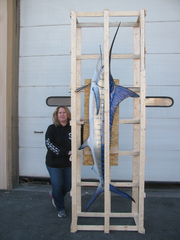 Let our marine taxidermists work closely with you to create the Striped Marlin mount of a lifetime. 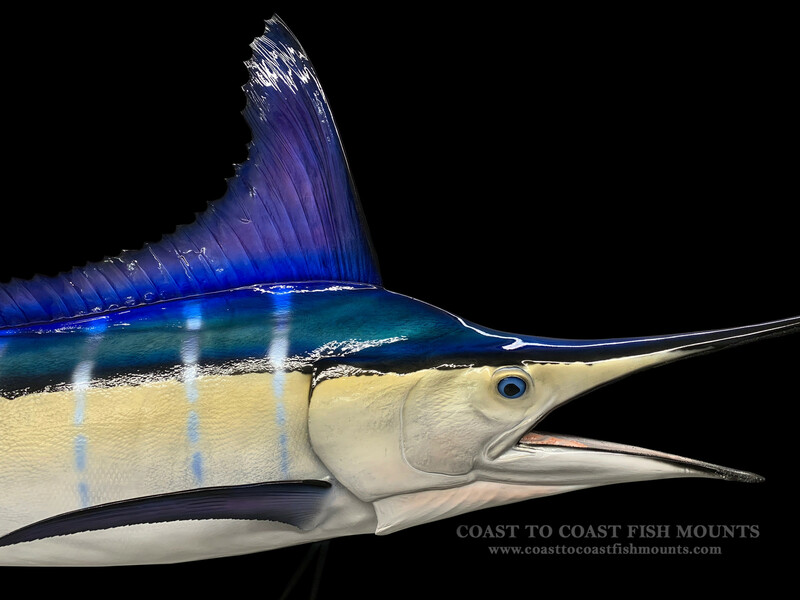 Our Striped Marlin fish mounts are museum quality art pieces that look like LIVE FISH. The finest materials combined with highly skilled workmanship that will last a lifetime without discoloring or aging. 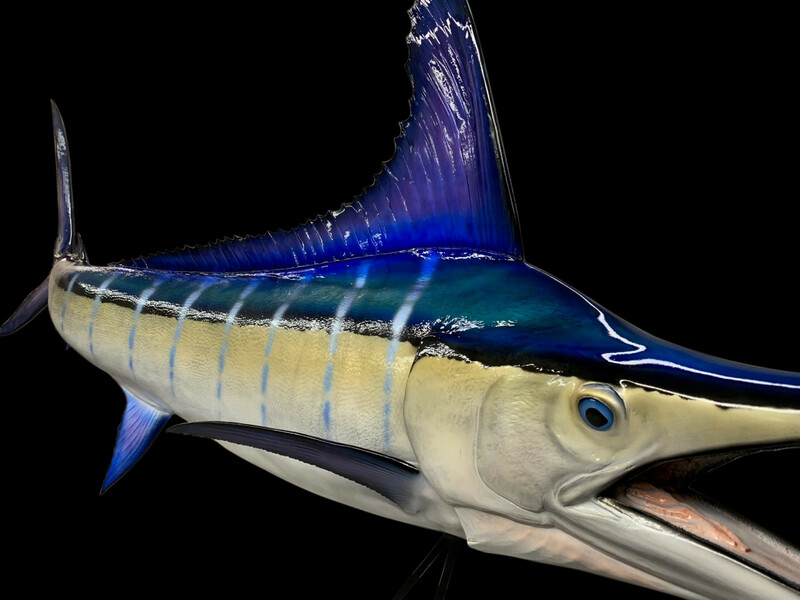 Striking anatomical posing as well as color accuracy holds the key to a meaningful Striped Marlin fish replica. Striped Marlin can display many different color patterns. We have the knowledge and capacity to match the colors of YOUR FISH. 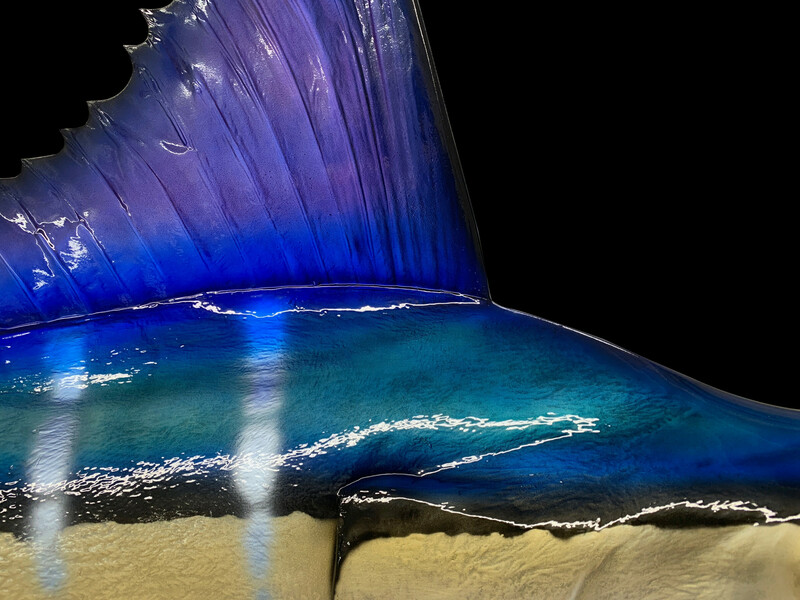 With or without a photo we will work close with you to custom paint your fish replica to match your fish exactly! 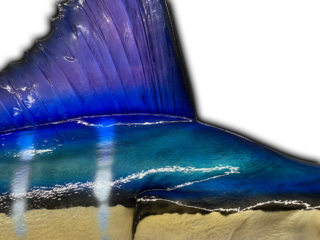 Custom blended translusive lacquer paints and the finest clear eurethane topcoats are always available at Coast to Coast Fish Mounts. 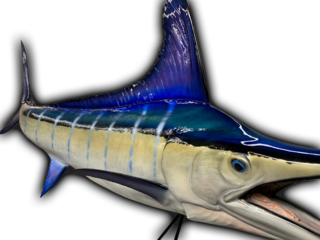 Our Striped Marlin fish replicas are available in customer pleasing high action anatomical poses, as in traditional slight bend to the head, slight bend to the tail, swimming pose, leaping pose, tail walker, and rolling down poses. Open mouth, open gill, and complete inner mouth detail is standard. We build, own, and stock over 2000 fish replica molds of all sizes and species that are custom created and painted for you in our facility one fish at a time to match the length, girth, and all of the specific characteristics and details only YOUR FISH displays. Available in sizes 18 to 118 inches. Average Weight/Length: The largest striped marlin live in the cool waters off New Zealand. That nation owns the current all-tackle world record, a 494-pounder caught back in 1986. New Zealand is still the world’s hottest spot for those wanting to catch the very largest striped marlin. Location & Habitat: Striped marlin are species generally from the Pacific waters; however, striped marlin still cover the widest range of any billfish species. Striped marlin habitat stretches from the west coast of the United States, Mexico and South America across the wide expanse of the Pacific and throughout the Indian Ocean all the way to Africa and New Zealand. Cabo San Lucas, Mexico, is regarded as the world’s epicenter for striped marlin. Physical Description: A striped marlin’s dorsal fin is much taller, nearly as tall as the depth of the body. So, if your marlin has a very tall dorsal, it’s a striped marlin, whereas the blue marlins dorsal fin is no taller than roughly half of the depth of its body. A striped marlin has a more flattened look to it, whereas the blue marlin is rounder. 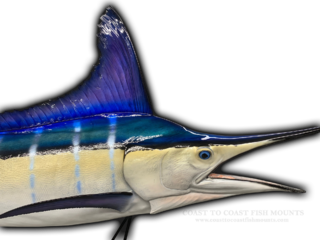 Striped marlin can be caught fairly close to shore, and lacking the size and weight of the blue marlin or the black marlin, the striped marlin is more acrobatically inclined. Fishing methods include trolling whole fish, strip baits, or lures; also live bait fishing. 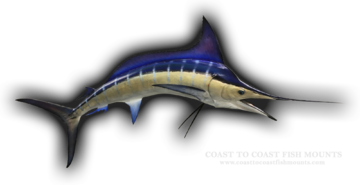 At Coast To Coast Fish Mounts we have the capability to match the distinct characteristics that only the striped marlin displays when doing a striped marlin replica mount. J & L Pitruzzello & Co.